Scots Pine story is now posted on its own page, under tree stories. Please click here or follow the links above. This is a tree I have been familiar with all my life, and yet never really known; it has always felt rather remote. In its wild state, it stands high on the hillside on dry soils, often in small groups pointing the way. The Six Pine Trees of Pooh Bear’s world are a landmark and indicated on the map although little featured in the stories. Arthur Ransome had a pine tree to hold a lantern marking the way through the rocks into harbour in ‘Swallows and Amazons’, then in ‘Swallowdale‘ a row of four pine trees pointed the way on an otherwise bare hillside. Alfred Watkins wrote in ‘The Old Straight Track’ that Scots Pines had been marking ancient sites on Leylines for millennia, despite the fact that he admitted to never having seen an old tree. 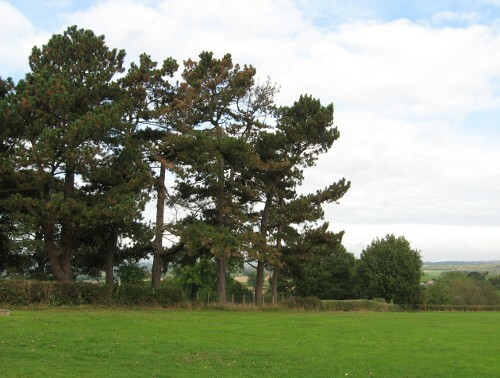 He was most likely wrong in the timing, since many Scots Pines were planted in England by Landscape gardeners and artist landowners of the eighteenth and nineteenth centuries seeking to romanticise the countryside, tumuli being particularly prone to new plantings of Pines or Beeches, but right in them as a landmark. Single trees were often left when others were cut down in order to mark drovers’ paths, some of which may themselves have followed leylines. Single trees were also planted in the Highlands of Scotland to mark the burial sites of warriors, allowing their spirits to climb the tree into other worlds. Scots Pine is one of our three native confer trees (the others being juniper and yew), with the Caledonian forest dating back to the last ice age. It is a fast-growing, short-lived tree compared to many, but will grow from seed in its own shadow and thus regenerate without the need for a natural disaster. It will also grow happily with other trees such as birch or larch, sheltering them as they grow without casting too much shade. Many animals rely on pine forest, or the blaeberries and cowberries that frequently grow in its shade. Notable species include red squirrels, pine martens and Scottish wildcats, as well as birds such as Scottish Crossbills, Black Grouse and Capercaillies. Roe and Red deer like eating pine so much they prevent the natural regeneration of the forest. Wolves, Bears, Elk, Beavers and Lynx all used to live in the pine forests, the latter two may do again as there are many who wish to see their reintroduction. Sadly it is often treated as a monocrop in plantations to produce construction and joinery timbers, or telegraph poles, forests which have no understory and support very little wildlife. Pine is very high in vitamin C, and the needles can be used to brew a healing tea for bronchitis and other chest complaints. The smell of fresh pine is good for clearing congestion, clearing the blocks in what we can see and uplifting us. Pine trees reach for the sky. This is particularly relevant in the middle of winter when many of us need a boost, and gives us a good reason to have a pine tree in the home for a few weeks! In fact it was the huge pine bonfires lit at Yule in various parts of Northern Europe which gave rise to the tradition of the Yule Log, and later the Yule or Christmas tree. In Roman times it was not Yule that celebrated the pine tree however, but the Spring Equinox. The Earth Goddess Cybele turned Attis, her lover, into a pine tree after an incident in which he was unfaithful to her and then castrated himself in remorse. In some versions online he appears to have been tied to the tree and gored by a bull or a wild boar. I have read two endings to this sorry tale, that the tree was burned after three days and Attis was reborn from the ashes, and that Zeus later made him evergreen so that Cybele could have him as a companion all year. The Spring rites paralleled those often enacted in late summer with the corn spirit: in a three day ceremony, March 22nd-25th each year, an effigy of a man was made and attached to a pine trunk and bedecked with flowers. The second day trumpets were blown, and on the third a sacrifice, usually of blood from the Priest, was made to appease the Earth Goddess in order that Attis may be resurrected and the fertility of the Goddess restored. The pine cones were often seen as phallic, continuing the male fertility theme from Attis and Cybele – despite actually being the female flowers. The double spiral formed by the seeds was also a symbol of life and fertility. This may be where the idea of pine being an aphrodisiac came from… Pinecones are sometimes fixed to the end of a staff or wand and used in fertility magic, while pine needles are sometimes used to purify a space and remove any negativity. Finally from an art and crafting point of view, pine is used to make paper, the sap is used to make turpentine for painting and varnishing, and rosin used for giving friction to violin bows. And when a break is needed, it formed brewer’s pitch to line beer casks, and its close relative sabina pine flavoured retsina wines. Holly is now published on its own page – please follow the links above. Prickly even as dried leaves, holly was a tree that took me a while to get close to and really appreciate. However, it grows so easily underneath deciduous trees and is so unlike other British natives that I have come to really enjoy its glossy leaves that reflect light on the dullest of days. I have several holly plants in my garden – a small tree in the corner which has been here longer than we have and now forms part of the hedge, a few more we planted in gaps in the hedge, and an abundance of seedlings that spring up all over the garden. I think it’s trying to tell me something! It is traditionally effective against evil spirits, and will apparently give protection to elves and fairies. I’m not sure how this works personally, but many animals may take refuge within its evergreen branches, and besides ponies and cattle, deer, sheep and rabbits make a good meal from the leaves and the bark. 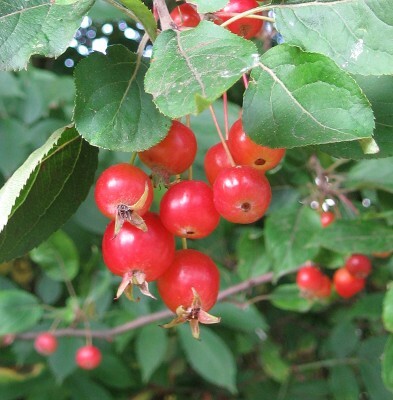 Birds also enjoy the berries, which are borne on female plants. They are poisonous to humans, however the Holly leaves are said to make a good infusion for easing catarrh, pleurisy, coughs, colds and flu. The wood was prized for its ability to take colour stains, and was used extensively in marquetry. It was also used for spear shafts, chariot wheels, walking sticks, and for hedging as it forms an impenetrable barrier. The fourth tree story, Apple, is now available for reading on its own page. This was a story that could have filled a novel, with a few sub-plots of course, so I make no apology for its being longer than the previous three! In fact if I had continued with my original idea of Julie finding the cottage and then buying it, you might never have got to the apples… Yes the narrator’s name is Julie, and until I knew her name the story didn’t flow. However she’s not one for talking about herself much, so I thought I’d better tell you here instead. I love eating apples, and always have done as far back as I can remember. I currently have five apple trees in my garden. Three are cordons, Sunset, Bountiful and Arthur Turner, planted the first winter we lived here and on M26 rootstocks, almost too vigorous for their own good. The fourth was found in our hawthorn hedge and allowed to grow up, a very early cooking apple that tastes delicious and ripens even before Discovery apples make the shops, but it doesn’t keep well. It is a tip bearer and pruning it each winter usually involves a ladder or a scaffold tower. The fifth tree was planted eighteen months ago, crab apple Laura. It is still establishing itself but I look forward to some dark red fruit next autumn. With such a mild winter last year the trees failed to set their usual abundant crops, so I’m hoping for some snow this year! I’ll add some more photographs next year, starting with the blossom, which on Arthur Turner is usually stunning. Apple feels almost like our National fruit. 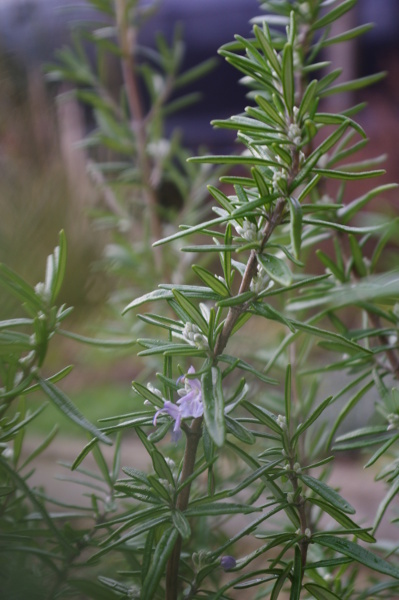 It is ideally suited to the English climate, keeps well, and is varied enough in its fruits that it caters for all tastes. Sweet, sour, savoury, raw, juiced, cider, brandy… Apple also seems to be becoming a staple ingredient for commercial herb teas – which says more about the apples than the teas! And while trees can be pruned for shape or size, they will still produce fruit happily by themselves and feed the bees each Spring. Apples are full of soluble fibre, present even in the juice, which is great for the digestive system. The acid helps balance the body in all kinds of ways, so is helpful for rheumatism and arthritis, and the pectin is also good for removing toxins such as heavy metals. The juice is good for the skin too, hence rubbing fruits on warts and burying the remains. Various compounds within the fruit also improve lung function, liver function, and guard against cancer. An infusion made from the tree bark will help bring down a fever. An apple at bedtime is said to improve the quality of sleep, although if placed under your pillow instead of eaten, it is said you will dream of the one you will marry. There are probably more stories associated with the apple tree than any other tree, thanks to its generous nature and the fact that it is one of the few trees whose fruits can be eaten straight off the tree. Just to mention a few: Adam and Eve, Labours of Hercules, Aphrodite, many Celtic tales, Norse Iðunn, Snow White, Johnny Appleseed, William Tell and Isaac Newton. Many folk traditions are centred around apple trees, such as wassailing, apple bobbing, and divination. Traditionally apple wood was used in windmills, since it was hard enough for the cogs and doesn’t need oiling. It also makes good handles for wood carving tools, or the mallet used to hit them with. Other uses include woodwind instruments, carving or inlays. It will burn well, although this may be a waste, but if used to smoke cheeses or meats the results are delicious. It will come as no surprise that apple is used magically for healing, fertility or love. However it is also often used for faerie magic or in dealings with the otherworld, helping to connect their world and ours. 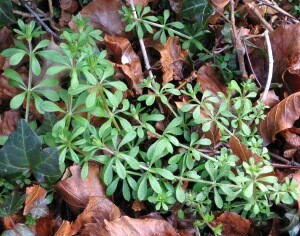 To me, one of the first signs of Spring is picking a handful of stickyweed and making a cup of tea with it. It is a delicious pale-green, fresh-tasting pick-me-up, bringing all that wonderful energy and growth and zest for life into the water and then into me. Snowdrops are winter flowers, but the stickyweed definitely heralds that Spring is here! Also known as cleavers, sticky willy, goosegrass or Galium aparine, it is the plant you probably threw at your friends backs when running around the playground, and gave you rashes on your legs when walking through fields infested with it. As a gardener stickyweed is one of those weeds I have long had a grudging admiration for. It grows from nothing each year, scrambles up and over any other plants in its way to completely cover them, breaks off when you try to pull it out, and deposits is sticky seeds everywhere. On the soil, on your clothes, in your hair, there will be seeds, so that it can repeat the whole show the following year. Or even later in the same year, if it has got going early enough. However it is a lot easier to deal with than many weeds, as being an annual it doesn’t have a great tap root or rhizomes to grub out. The roots may extend some distance, but they don’t form a mat or even need much attention; their best use is to stop worse weeds getting their way. Once I discovered herb teas a few years ago, my respect grew. Usually by mid-February enough can be found for a brew. I pick a handful of young growth and use it in place of a teabag, just letting it steep a little longer. Apparently it is good for the lymph system and for water infections or kidney stones, for cleansing the liver, for skin conditions such as eczema, for lowering blood pressure, reducing anxiety and bringing calm. I have since learned that traditional uses include filling a mattress as with bedstraw – its natural ability to stay where it is put stops it going lumpy; and in Northern Europe, as a sieve for separating milk. The seeds can apparently be roasted and used as a coffee substitute, and the roots will make a red dye. And geese like to eat it, hence one of its common names. But for me it is simply the positive energy it brings that is like shining a light into the dark cold of winter, and bringing everything to life once more. And of course it is so nice to make something so positive out of what is otherwise a pile of weeds!